We have received the latest toolkit “Shadows and Silhouettes”. The toolkit covers topics on shadows: the shadow of Earth, phases of the Moon and Venus, and Solar and Lunar Eclipses. It also covers topics on Silhouettes: Transits of Mercury and Venus, detecting transiting planets around distant stars, and NASA’s Kepler Mission – NASA’s first mission to detect transits of Earth-size planets in the habitable zone of Sun-like stars. It includes Power Point presentations and animations. This toolkit will be particularly helpful with the upcoming Mercury Transit on November 8. If anyone is interest in a copy of the CD from the toolkit for working with the public, please contact me. On November 16, we will have the pleasure of hearing from David Koch, one of the principal scientists working on the Kepler Mission. This NASA mission will launch in 2008 to search for habitable planets and explore the structure and diversity of planetary systems. The mission will survey a large sample of stars in our neighborhood. See the NASA website, “http://planetquest.jpl.nasa.gov/Kepler/kepler_index.cfm”, for more information on this exciting mission. More information, including where to download the PowerPoint, will be available closer to the date. As usual, I will send out an email reminder. Please note that the previous teleconferences are all available to review. Most of them have an audio recording that you can listen to while you go through the PowerPoint. Written transcripts are also available. If anyone is interested in obtaining these on CD, please contact me. All kidding aside, insects are not in control. The real “butterfly effect” is driven by, for example, global winds and ocean currents, polar ice (melting and freezing), clouds and rain, and blowing desert dust. All these things interact with one another in bewilderingly complicated ways. And then there’s the human race. If a butterfly can cause a tornado, what can humans cause with their boundlessly reckless disturbances of initial conditions? NASA’s Earth System Science program provides real-world data for these models via a swarm of Earth-observing satellites. The satellites, which go by names like Terra and Aqua, keep an eye on Earth’s land, biosphere, atmosphere, clouds, ice, and oceans. The data they collect are crucial to the modeling efforts. Some models aim to predict short-term effects—in other words, weather. They may become part of severe weather warning systems and actually save lives. Other models aim to predict long-term effects—or climate. But, long-term predictions are much more difficult and much less likely to be believed by the general population, since only time can actually prove or disprove their validity. After all, small errors become large errors as the model is left to run into the future. However, as the models are further validated with near- and longer-term data, and as different models converge on a common scenario, they become more and more trustworthy to show us the future while we can still do something about it—we hope. National Aeronautics and Space Administration. CloudSat is one of the Earth observing satellites collecting data that will help develop and refine atmospheric circulation models and other types of weather and climate models. CloudSat’s unique radar system reads the vertical structure of clouds, including liquid water and ice content, and how clouds affect the distribution of the Sun’s energy in the atmosphere. 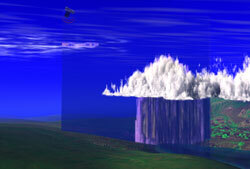 See animation of this data simulation at www.nasa.gov/mission_pages/calipso/multimedia/cloud_calip_mm.html. 1. STILL NEED A CALENDAR? I have already placed two orders for calendars. If you did not contact me yet and need a calendar, let me know soon. I don’t know if Kalmbach has any calendars left, but it won’t hurt to try to place a third order. The cost this year is $6.50. When I did my series of articles on the mythology of the night sky, there were a few constellations that I skipped over either because they didn’t fit, or because they were too close to the mythology of other constellations. So I’m going to try to do a series of articles on this missing constellations. Now it just so happens that our hero named Perseus is passing overhead on his winged horse, Pegasus. He is on his way home after slaying the gorgon Medusa, whose head he also happens to be carrying with him. He hears her cries for help, looks down and sees this fair damsel in distress, swoops down on his magnificent horse and as the sea monster comes ashore, he whips out the head of Medusa. Cetus looks on the head of Medusa and immediately turns to stone. Perseus unchains Andromeda and as daylight approaches, our movie has ended. This is a very old constellation that possibly could even pre-date the Greek legend. Some have identified Cetus with the Euphrates god Tiamat, who plays a role in the ancient Mesopotamian creation story. However that story is so violent that I have rated it R and have not shown it in this theater of the night sky. The constellation itself is a very faint one with only one star of second magnitude. It is, however, the location of a noted variable star, Mira. The only other thing of note about the constellation is that it contains the south pole of the Milky Way. "The popular web sites Space Place and StarChild are sponsored by this organization." The buzzer sounded immediately, as the child with the fastest reflexes got the chance to answer. You, our partners, have done a great deal to make The Space Place so well known. By your dedication to the education and motivation of our youth, and your support and promotion of resources such as The Space Place, you have helped us to spread our messages about the importance and excitement of space and Earth science, technology, and discovery. We are glad for our partnership with you and anticipate a long-continuing, mutually beneficial relationship. You can find my new book, Astronomical Observatories and Observers, on Lulu.com as below and I think this might be of interest to your society / members, perhaps you would be kind enough to mention it at your next meeting or via any newsletter you produce. Wednesday November 8 - 1:30pm, Public Mercury Transit Viewing at Blue Marsh at the pavilion on the top of the hill above the Dry Brooks Day Use Area. The Planet Mercury will begin its transit across the face of the Sun starting about 2:12pm and the Sun will set during the transit. We will have Telescopes and various other instruments available for safe viewing of this event. After Sunset, a short lecture will be held, followed by Astronomical viewing. Rain/Cloud out date will be Saturday Nov 11 starting at 6:30pm. Thursday November 9 - 7:30pm, Monthly Club meeting at the Reading Museum in the auditorium. Tonight's program will be presented by Dr. Jacqueline van Gorkom from Columbia University. Dr. van Gorkman's presentation is entitled "The Evolution of Galaxies in Different Environments." Tonight's speaker is sponsored by Mr. Keith Minnich, a long standing BCAAS Member. Thursday December 14 - 7:30pm, Monthly Club meeting at the Reading Museum. Tonight we will have our annual Holiday party and election of the 2007 BCAAS Officers. Please bring a covered dish or drinks to share at the festivities. We hope to see everyone there.